Find out all you need to know about our dog walking and pet care services with Walkies with Ace's Frequently Asked Questions. Q: What pets do you look after? A: We're based in Bromley and are happy to offer support and dog walking services to pet owners in the surrounding areas, including Beckenham, Beckenham Hill, Bromley, Downham, Eden Park, Elmers End, Park Langley, Ravensbourne, Shortlands, Sundridge Park, Langley Park. Take a look and read about the woodlands and parks we walk in. Here are some of our favourite places for dog walks. Don’t worry if you’re not in one of the places mentioned above – contact us and we’ll﻿ see if we can fit you into our dog walking schedule or suggest another walker you might not know about. Q: If I book an hour's walk, does the hour include travelling to and from the walk? A: Good grief, no! If you book an hour's walk, your dog will get a walk for that full hour. 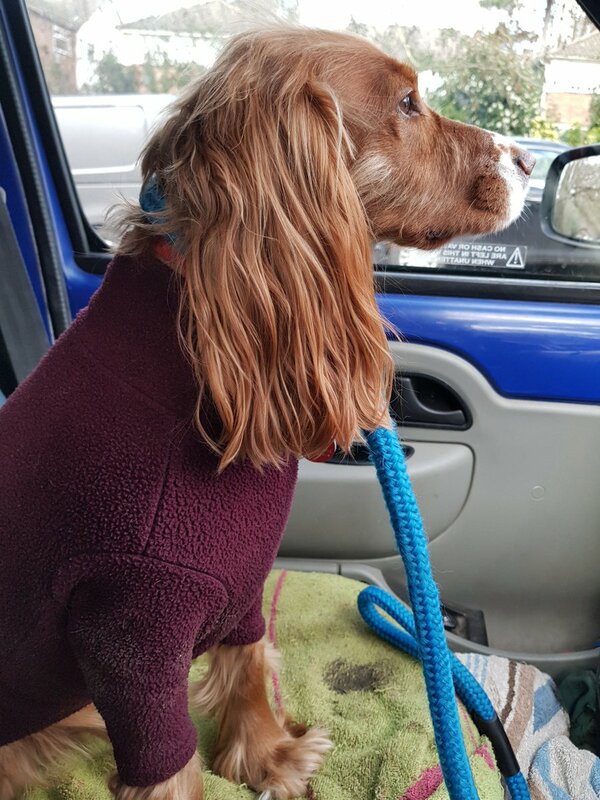 Our service offers great value for money as Walkies with Ace will come to your house, collect your pet in the Dog Van, drive to one of our favourite walking sites, walk for an hour, then drive your dog back home. So your dog will be out of the house for at least 2 hours across the middle of the day, and sometimes longer! Q: I'm interested in day-care/walking/boarding for my dog. What happens next? Q: Can my dog bring his favourite toys with him when he stays? Our dogs love to play but we'd prefer you don't bring toys so there's nothing to fight over. Dogs can get quite possessive over their favourite toys and it's important that we all get along nicely. Once your dog is settled and calm we will of course let them have some playtime! A: We prefer you to bring your dog's bed so your dog feels right at home. So your dog doesn't miss you too much, it's a great idea to bring something that you've worn and has your scent on - like an old t-shirt - so your dog can feel connected to you. Q: I have a new puppy - is it too soon to contact you? A: We don't usually recommend dog daycare for puppies under 6 months. That's because we think other options are better suited to young pups who need to get used to being along for some of their day. We'd recommend two drop-in visits a day for very young pups. And shorter walks, increasing as they grow. The Kennel Club gives guidance of 5 minutes walk per month of age (twice daily). Puppies need downtime and chance to sleep - our experience shows they usually find being in daycare with other dogs too exciting and over-stimulating. If they get used to having company 24/7 in daycare, then they are more likely to develop separation issuess. So this is the reason we don't offer daycare to puppies. Q: Are you able to collect my pet? A: That’s no problem at all – we collect and drop off all our daycare dogs - included in the service at no extra cost. We also collect and drop home all the dogs we walk. So if you work long hours, you can leave your pet at home and we can pick him up at a time to suit your pet. That’s better for your pet too as a walk in the middle of the day will give him something to look forward to. We can arrange to be key holders for your home. This is extremely useful if you lock yourself out, as a quick call to us and we can arrange to drop your spare keys off. That’s much cheaper than calling a locksmith and paying for new locks and new sets of keys! Q: If you look after a set of my keys, will they be stored securely? A: Our client’s security is essential to us. Keys are stored in a locked and secure place and are not labelled with any identification that would link them to your property.﻿ Sophie has also a current CRB check which you can ask to see a copy of. See our range of home security services and prices on our prices page. Q: What if my pet is on medication, can you make sure he gets his treatment? A: Pet medicine is not a problem at all. When we first met you and your pet, we’ll take full details about your pet’s individual requirements, including completing a consent form. We also keep a log of all medication administered with notes. Q: What happens if my pet gets ill whilst you’re looking after them? A: Of course that’s a situation we hope doesn’t happen. But if it does, then rest assured we will do our very best. We are trained in dog first aid so would be able to deal with an emergency situation immediately. If a dog in our care needs vet treatment then we would make the appropriate calls and ensure your pet receives the treatment appropriate, with the owner's given consent. When you book our services we take your contact details and those of your pet’s regular vet, so if your pet gets sick, we can make the appropriate calls. We will always try our hardest to contact you first to see that you know straight away if something happens to your pet. However, if for any reason we are not able to contact you (say you are in a meeting for example), then our priority would be to ensure your pet receives appropriate treatment with his local vet. When we first take on the care of your pet, we will ask you for permission to look after your pet in the event of an accident or injury and permission to administer first aid should it be required. This is similar to teachers being in ‘loco parentis’ for your children if they are on a school trip without you.﻿ You will be asked to sign a consent form as part of our service contract. Q: What is a CRB Check? A: If you are going to be giving your house keys to a dog walker so they can enter your home to collect your dog while you’re not there; it is essential for you to check that you are not giving your house keys to someone with a criminal record. I applied for a Criminal Records Bureau (CRB) check through NARPS UK (National Association of Registered Pet Sitters) so you can see that I have a clean record. This is why I have had the check done. Not all pet sitters have them, so please check for your peace of mind before commissioning anyone’s pet care services. My having a basic disclosure CRB check through Narps UK gives you, my client, peace of mind that you are giving your keys to someone who does not have a criminal record. A Basic Level Disclosure will detail all criminal information considered non-spent under the Rehabilitation of Offenders Act 1974 or state that there are no such convictions. Q: What is separation anxiety and how do I know if my dog suffers from it? A: Separation anxiety is when a dog gets distressed by being away from his 'pack'. This can be when you and your family leave the house, leaving your dog home alone. Your dog could be getting distressed by being left alone for long periods of the day. If he is howling, whimpering, unable to settle in his bed, exhibiting obsessive or repetitive behaviour such as pacing, chasing his tail, maybe chewing furniture or other things he shouldn't, then it's possible he is experiencing separation anxiety. Q: What can I do to stop my dog suffering from separation anxiety? A: There are things you can do to help him, basically by easing his boredom, so he has things to do when you leave the house. There are a number of 'activity' toys on the market, specially designed for dogs. These will encourage him to chew his own toy (and hopefully ignore your new sofa) and keep him busy. It's like giving your dog a job to do. Of course, the best thing for Fido is to book him a nice long walk, perhaps with a group of dogs that will give him something to look forward to and some special play-time to let off steam and all that exuberant doggy energy which might otherwise find an outlet in repetitive, stressed behaviour in your house. Q: I'm looking for a job walking dogs, can you help? A: Walkies with Ace does not employ staff so unfortunately we won't be able to offer employment. If you want to gain experience we suggest contacting your local animal rescue centre as a volunteer. Also The Cinammon Trust walk dogs for people that are unable to so check to see if they need volunteers local to your area. A: Walkies with Ace does not currently offer work experience. Try one of the larger rescue centres such as Battersea Dogs & Cats Home or The RSPCA.